Special Deal - Find out how heavy albatross chick can actually be? What do they eat? What's the wingspan of the biggest seabird? Discover huge 7kg+ Royal Albatross chicks at the worlds only mainland royal albatross breeding colony. 30 minute Express tours at expressly special prices. Bookings essential 4780499 or reservations@albatross.org.nz. Dunedin is uniquely privileged to be the only place in the whole world where you can easily see these amazing birds breed. It's the 80th anniversary of the first chick fledging from this site in 1938. Learn all about Lance Richdale and the incredible work he did to protect the first chick and see it safely fledge. Talk to our expert guides and discover more astonishing facts about albatross - such as why they 'cry' when they drink salt water... 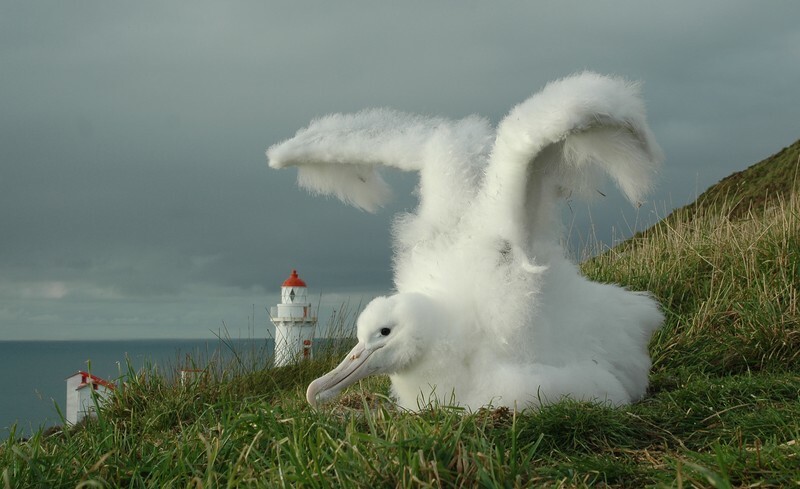 While you're here, learn about the other 20+ birds that breed at Pukekura/Taiaroa Head and what makes Dunedin "The Wildlife Capital of NZ" and "The Seabird Capital of the World". Stay the whole day and visit Blue Penguins Pukekura for a special family price for the Science Festival. Science Festival Special - get out and explore!